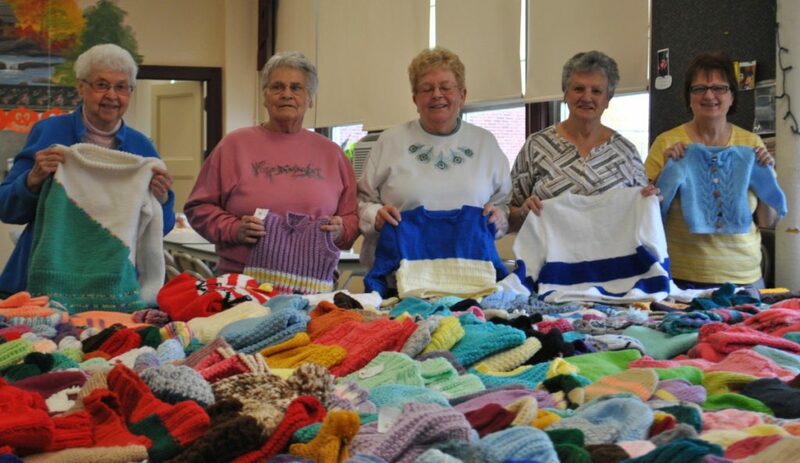 Women of the Knitting for Charity group in Biddeford produce hundred of knitted items – just in time for the return of cold weather. BIDDEFORD — Well over 100 children will be a little warmer this winter, thanks to the work of a local knitting group. On Monday morning there were hundreds of knitted items – enough to completely cover 12 tabletops – at the J. Richard Martin Community Center. The items – handcrafted sweaters, child-size hats with matching scarves and mittens – were the accumulation of the past year’s efforts of Knitting for Charity, a group that’s part of the Biddeford 50 + Club. The knitting group meets every Monday to stitch items for children in need. The group of about 20 knitters, including some who knit at home, contribute their wares to the collection. The group was started in 2000 by Sister Theresa Couture, a local nun and retired educator. The 86-year-old is not a knitter, but she saw a need in the community, and had the connections and skills to lead the group and see that the items are given to those who need them. “When I was working at the York County Jail, I saw kids come in to visit their parents. Their jackets didn’t fit, they had no mittens, no hats. I said, ‘I have to help,’ ” Couture said. The group began with just a couple of knitters, and has grown steadily over the years. Couture reaches out to local schools, day care centers, churches and other organizations to distribute the items in time for winter. Couture admires the group of knitters, saying they are not only very skilled, but are also very generous. “They’re not looking to be rewarded,” she said. Louise Bosse said she’s been part of the knitting group for two years. “I enjoy it tremendously. I look forward to Mondays,” she said. Bosse makes a variety of items, including socks, scarves and sweaters, but her signature pieces are her mittens, which have the thumb in the front of the mitten instead of off to the side. “I can always pick out my own work,” she said. Bosse enjoys being able to help others. She also enjoys the community of knitters who have become her friends. They share patterns and yarn, and talk about life, she said, joking that it has become a sort of therapy group. The group is accepting yarn donations. Those who have brand new yarn they’d like to donate can call the Biddeford 50 + Club office at 282-5005 for information.